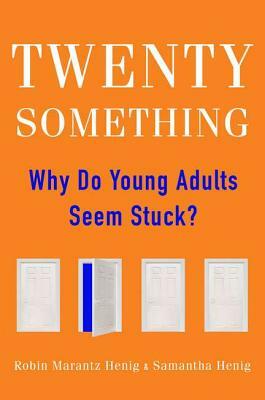 Why Do Young Adults Seem Stuck? Hudson Street Press, 9781594630965, 304pp. What does it mean to be young today? In the summer of 2010, Robin Marantz Henig wrote a provocative article for the "New York Times Magazine" called What Is It About 20-Somethings? It generated enormous reader response and started a conversation that included both millennials and baby boomers. Now, working with her millennial daughter Samantha, she expands the project to give us a full portrait of what it means to be in your twenties today. Looking through many lenses, the Henigs ask whether emerging adulthood has truly become a new rite of passage. They examine the latest neuroscience and psychological research, the financial pressures young people face now, changing cultural expectations, the aftereffects of helicopter parenting, and the changes that have arisen from social media and all things Internet. Most important, they have surveyed more than 120 millennials and baby boomers to give voice to both viewpoints of a conversation that is usually one-sided. Acclaimed science journalist ROBIN MARANTZ HENIG is the author of eight books and a contributing writer to the "New York Times Magazine." In 2010 she received a lifetime achievement award from the American Society of Journalists and Authors and a Guggenheim Foundation grant. SAMANTHA HENIG is the web editor of the "New York Times Magazine."